I can remember going to see a urologist, Dr. Allen Miller in this building. Dr. Miller’s son, also named Allen was a successful amateur golfer and played on the Walker Cup team in the 1960’s and 70’s, He also played on the PGA tour for a few years in the 70’s and 80’s, but didn’t have a lot of success. I remember going to the doctor here, Dr. Anderson (“Dr. Andy”, I called him) was my pediatrician. There was a big counter downstairs, and I was too little to see over the top. 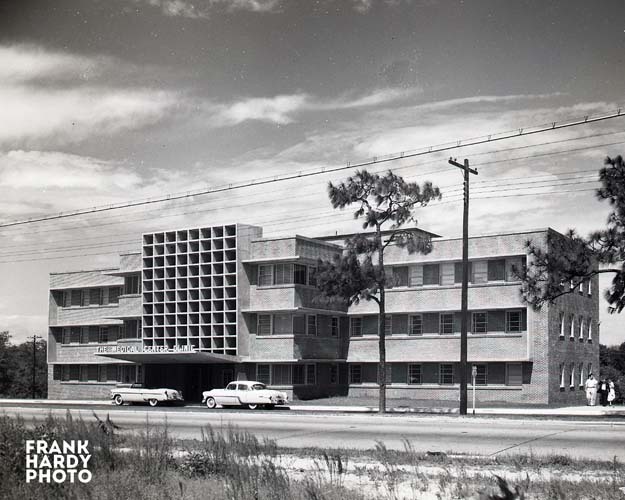 WAS ACROSS THE STREET FROM Pensacola maternity hospital..
Well I’ll always have found memory of this place! My first conscious memory of a doctor. Dr. Wolf, Ear Nose and Throat, jamming a thin silver vacumn tube into my ear for an earache. It hurt worse than the ear ache when it hit bottom,… but then later it did stop hurting. I was about 5. 196….